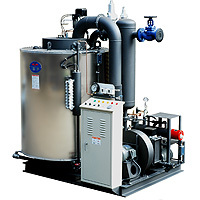 Steam Boilers - Taijune Enterprise Co., Ltd.
HES steam boiler is fully automatic with automatic level system, discharging system and burning control system. It is designed under extreme safety concerned, for the prrpose of reducing the risk of getting hurt. Besides offering stream boilers, we also presents various kinds of boilers, ensuring to meet your needs. Exclusive for 200kg/hr~2000kg/hr fuel systems. Complete combustion system for c heavy oil. Water tube boiler, vertical tubular assembly, replaceable for each tube.